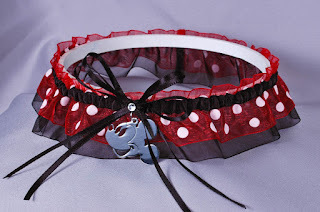 Sugarplum Garters: 2012.11.05 | Custom Wedding Garters! It's been awhile since I've shared any of my wedding garters, but rather than spotlighting any new items I have available for purchase, I thought it would be fun to share pictures of a few of my most recent custom garters. I'll be honest: sometimes I get tired of making the same garters day in and day out. My Yankees garters are by far my best-sellers and I usually have at least one set I'm working on in any given week, but man, do I get sick of working with navy blue and white all the time! =P So I LOVE when I get a custom request for an item that's out of the ordinary ~ such requests usually require thinking outside the box a little, and the results are always fun and different! This wedding garter set was a custom request made by one of my friends who is a skydiving fanatic ~ it was given as a gift to one of his skydiving friends.The bride's wedding colors were hot pink and brown, and we embellished each garter with a parachute release pin to represent her love of the adrenaline rush-inducing sport! This Mickey Mouse themed wedding garter was purchase as a gift by the bride's sister ~ the couple wed in Disney World so the garter was perfect! This adorable panda garter was the result of one of my more unusual requests. The bride was very specific about what she wanted and of course, I had to ask for the story behind her request! In her own words: "When we first started dating, my fiance took me to a San Francisco Giants game. It got really cold in the evening, and I needed a hat. The only hats that were available were panda hats, because one of the Giants' players is nicknamed "Panda." So I wore this stupid, fuzzy panda hat because I was freezing. I looked ridiculous. After the game, we walked down the street to find a restaurant (I wasn't even thinking about the hat at this point) and people kept calling me "Panda," trying to "pet" my head. From that point on, my fiance has referred to me as "Panda." Looking back, I can't believe the name stuck! I just know the garter will make him laugh, but at the same time, he'll love it as a keepsake." If you're interested in ordering a custom wedding garter, I have a form here on my website where you can fill in the details of your request ~ I'd love to work with you to create something unique and perfect for your special day!